See, I was driving down the road when I saw these lovely pieces sitting there all alone, abandoned by their previous owner. I couldn’t just leave them there, so I loaded them into my SUV. They sat there for quite a while, then one day I decided to paint and change up the dresser for Kate’s room. The vanity was another story. It had quite a bit of damage, and when my husband went to get his golf clubs out one day, the mirror to the vanity got shattered. I was going to have a mirror cut to replace the old mirror, but never got around to it, so the vanity came in and got a nice coat of white paint, and the huge wooden mirror base just sat there…for months. Then, last week, I decided to clean the garage out. I had the base in my hands, carrying it to the trash when I decided to play around and see if I could turn it into something else. I brought it into the kitchen and painted the base using Maison Blanche La Craie chalk paint in Magnolia with a thin coat of Minwax to protect the paint afterwards. I painted the top and a few spots on the actual vanity using Valspar’s Lake Breeze. I patched some holes on the inside, and painted it with 3 coats of chalkboard paint, and sat it on top of the vanity. It looked so cool…and different. I took some cup hooks that I had from a previous project and hung some tin buckets. I filled them with some of Kate’s markers and colored pencils, then added another hook for her earphones. 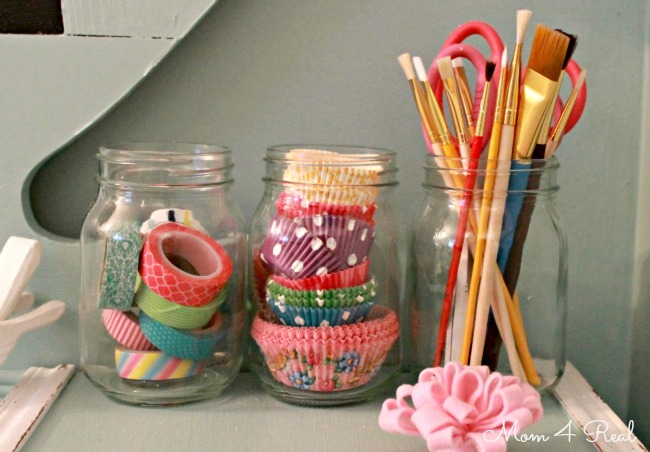 I grabbed some glass jars to use as storage for some of her craft supplies. 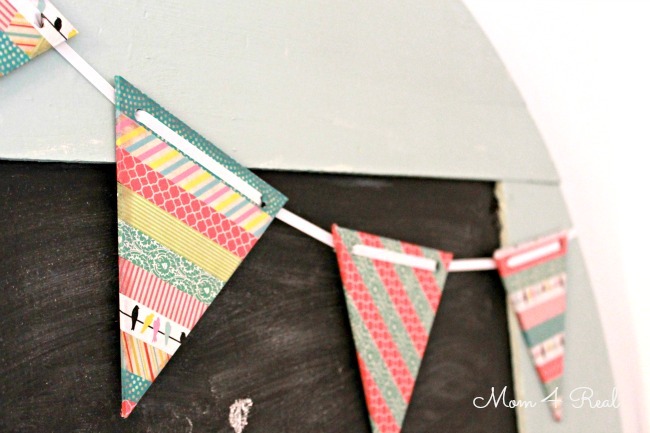 And made a quick bunting using washi tape to hang from the top. I used one of my new favorite tricks that I learned here on TT&J a couple of weeks ago, and sharpened some chalk with a pencil sharpener. Now Kate has the perfect place to craft the day away, and plenty of storage too. She can write messages, play school, or draw on her chalkboard. I am so glad that I didn’t throw that big piece out…I so love when I can take something old and turn it into something new and fun! Have you found any roadside treasures lately? Sharing at Between Naps On The Porch and Savvy Southern Style. 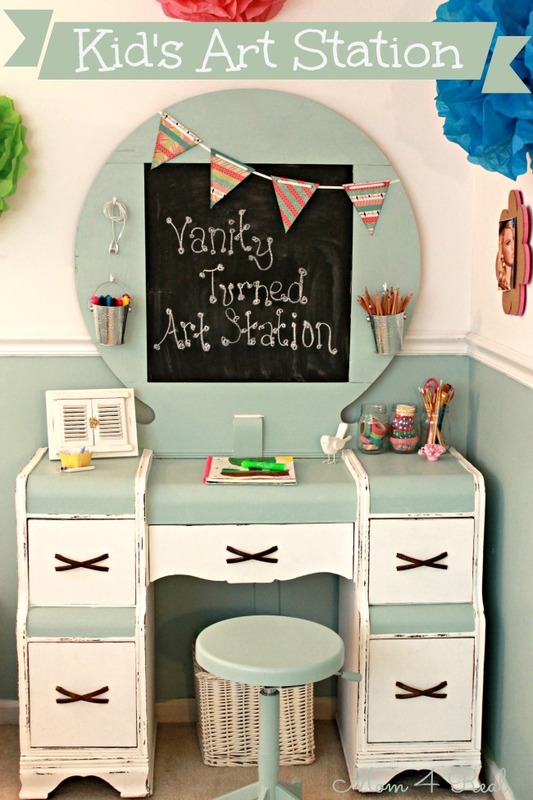 This vanity jumped out at me right away when I saw your daughter’s room reveal–SO adorable! I love the addition of the bunting and other colorful elements, too. I’m sure your daughter is in love with it! Have a wonderful weekend! This is such a fab project! I would have totally dug this as a little girl. I was forever drawing, doodling and coloring. It’s wonderful Jess. You did an amazing job!! You worked your magic and turned it into a masterpiece!…Happy Easter to you and your family! Just saw this project of yours on Fox Hollow Cottage. This is an awesome transformation. I will be pinning this onto a few of my boards. :o) http://pinterest.com/patinaparadise/ Have a wonderful Easter! What a fabulous transformation! Great idea! This is so, so cute Jessica! You have such a great vision. I would never in a million years have seen this sad dressing table and imagined it as the awesome art station that you turned it into. What an AWESOME idea Jessica! I LOVE how this turned out! 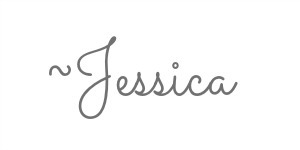 I love this idea, Jessica! What a great way to turn an oops into awesome! Love! Love! It’s just wonderful! I’m sure your daughter will like it for a long long time. This is just wonderful – I love the original piece of furniture and would have had that in my home as it was – but then seeing what you’ve done and how beautiful and creative it is has inspired me to take another look at some of the furniture I have lying around here taking up space waiting to be beautiful! I don’t need to tell you how fantastic that project turned out, so I’ll just tell you I pinned it. 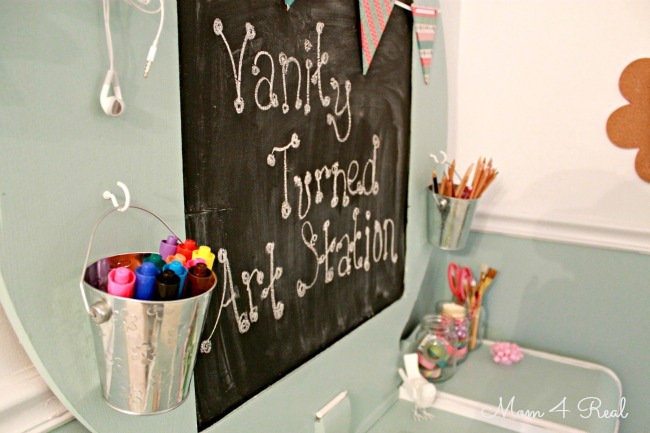 What a fun art station! Great job! Oh my gosh, I’m going to cry! I’ve been stalking thrift stores for months looking for one of those vanities to restore to it’s original use. But this is SUPER cute! 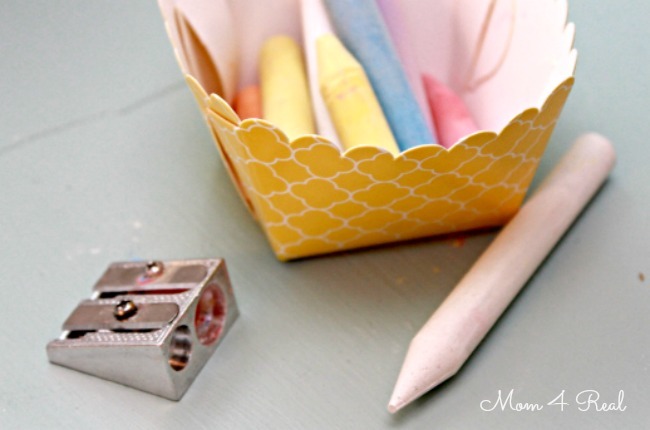 I hope you’ll consider linking up to the Upcycled Linky Party going on right now at http://love2upcycle.blogspot.com/2013/04/upcycled-linky-party-2.html I know our readers would just love this project! Looks absolutely brilliant! Love the chalkboard! Wow! What a cool idea, I can use it for my room! 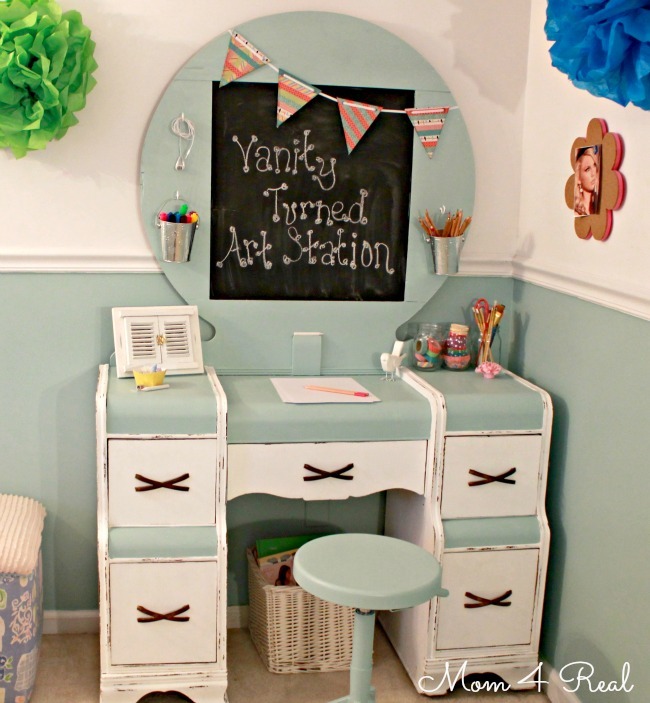 What a cool project, love how you transformed the desk, looks completely different. Great idea, and it looks great! Fabulous paint job! I’m pinning this!